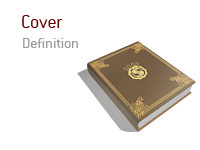 In card games, cover has several meanings. In some games, it means to play a higher-ranked card on a previously played card. In Contract Bridge, it refers to a card that compensates for a partner's loser. In a game like Spades, to cover means to make good on a bid. In online poker, cover play is a slang term that refers to the inexact science of playing just enough hands to avoid the appearance of a hit and run on a bonus. Many poker rooms will ban players from bonuses for hit and runs.